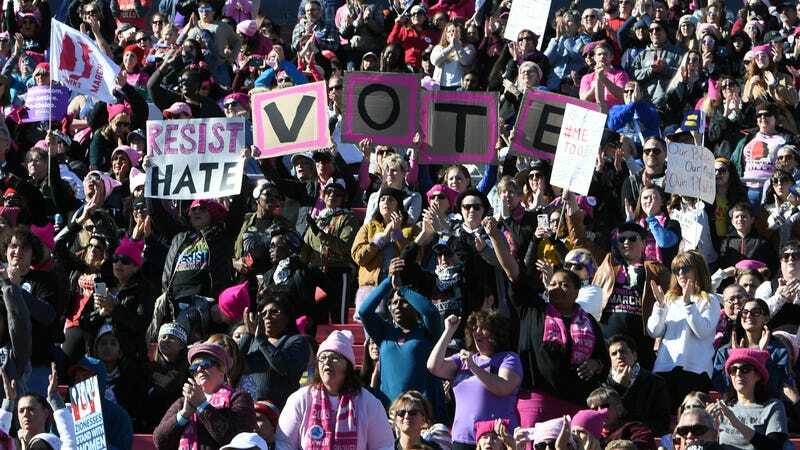 Demonstrators attend the Women’s March ‘Power to the Polls’ voter registration tour launch, Las Vegas, January 21, 2018. Photo: Getty. We’ve entered 2018, which means that the midterm elections are now less than a year away. And according to a new poll, Democrats are looking strong, thanks to women and independent voters. Better late than never. By 51 percent to 39 percent, more registered voters say they would support the Democratic candidate in their congressional district over the Republican. Democrats’ 12 percentage-point advantage on this “generic ballot” question is the largest in Post-ABC polling since 2006, although it is slightly larger than other polls this month. Judging from past elections, Democrats are expected to need a six- to eight-point advantage in national support this fall to gain the 24 seats needed win control of the House. Election handicappers say a Democratic takeover is possible, but not yet likely. But of course for all intents and purposes it’s one million years until Election Day 2018, and none of this matters if people don’t actually go out and vote. Vote! Everybody has to vote!